What Makes a Honeydoo Cutter? Honeydoo Cutters are handcrafted one at a time. 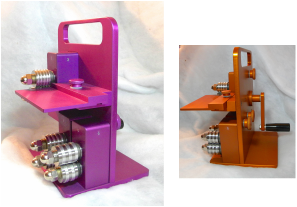 The cutter bodies are machined of anodized aluminum custom crafted to your color specification. The cutter cartridges are precision ground of hardened tool steel to achieve the precise cutting action that makes our cutters one of a kind. Our gears are nickel coated to keep them rust free with normal use. Prices are in US dollars only. Our manual model with one cutter cartridge is $595.00 with FREE SHIPPING. Our electric model with one cutter cartridge is $725.00 with Free Shipping.. It is perfect for people who cut kits or those with physical issues aggravated by shoulder movement. It operates with a foot pedal like a sewing machine. Additional cutter cartridges are $195.00 each with sizes from 2/32 to 16/32. See our Cutter Size chart for comparison to other brands. Larger sizes are available on request. FREE SHIPPING to continental United States. Please email for a quote on orders to Alaska, Hawaii, Puerto Rico or internationally. Custom molded case that holds five cutter cartridges for $75.00.